Denver has become a one of most recognized craft beer cities in the United States. Anthony Lopiccolo is working to push the boundaries of that title through the experimentation he does with food and sour beers at Goed Zuur. 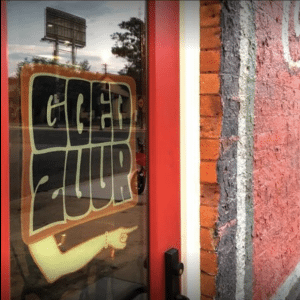 He and John Fayman opened Goed Zuur about a year ago after carefully crafting the idea for a restaurant that was unlike any beer bar Denver has seen before. Originally, Anthony began cooking at the age of eleven when his parents opened up a pizzeria in Detroit. His family always made their own prosciutto and signature dishes, which led him to develop a respect for the old-world techniques they carried on. This concept of traditional style plates being paired with certain wines is how Anthony and John wanted the beer to be applied. Sour beers are considered the gateway between beer and wine to most people in the scene. These beers use a specific bacteria and yeast in the brewing process that give the end product a tartness and funk flavor, which is where the sour aspect is noted. They include a range of styles such as Berliner Weisse, Gose, Lambic and Wild ales. “The beers that we are trying to present are a mix of delicate yet intense flavors, so combining the food with each elevates the beer as much as the food.” Anthony said. Anthony executes this balance by crafting a range of charcuterie, specialized small plates and more recently, a handful of larger entrees. The dishes are always changing to partner the rotating beers. 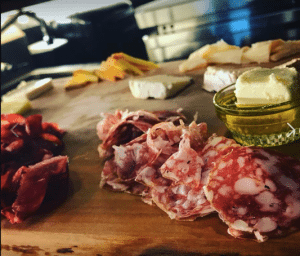 On the charcuterie menu alone, there are typically over five different types of prosciutto and other hams, four different butters and a whole page of cheeses from bloomy to blue. Tireless research and getting involved in workshops is how the culinary team is able to procure some of the most unique products on the market. In addition to larger meals on the menu, Anthony is also working to create a range of vegan and vegetarian options with two brand new cast iron skillets, gifted by William from Mammoth American Tattoo, that will only be used for cooking vegan items. 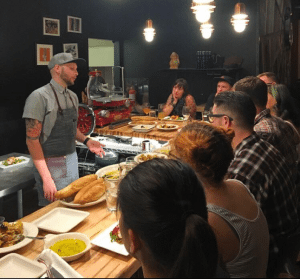 “I just want to have something which is going to make vegans and vegetarians happy alike and not have what people typically think of as vegan food at the bar. We’re trying to be creative in a way and say you don’t need to eat only fried foods and fries cooked in chicken fat when you go out.” Anthony said. So why choose Colorado as the birth place of this wild idea? To challenge the state of beer and elevate it. John and Anthony hope to push the envelope of what can be done in Denver and around Colorado through introducing and educating people on sour beer and wildly fermented items. They believe that once people are introduced to the sour concept they will enjoy it as well as respect the health benefits provided be the natural fermentation and probiotics. Though the sour beer, wild cheese and exotic plates may seem intimidating, there is nothing to be afraid of. The team at Goed Zuur want to take each customer on a tour of the sour world while still providing options such as the Bierstadt Slow Pour Pilsner and comfort food. Anyone could come in for a $3.00 after work beer or have a night out with friends with a $60.00 beer. The one-year anniversary of Goed Zuur will be on May 12 where the team hopes people will come celebrate and notice the changes they have gone through during their pilot year. On May 19 Goed Zuur will be doing a huge blow out for the Denver Jazz festival. The restaurant will be opening early at 11 a.m. and be hosting a live band from 7 p.m. to 2 a.m. In honor of the festival and all they have gained from the beer scene in Denver, they will be releasing their first collaboration beer with Westbound & Down Brewing Company called Acid Jazz Vol. 1. Whether one is looking for a haven for their taste buds, a new world to explore or just a place to have a good conversation with the head chef, check out what is going on at Goed Zuur.